Publisher: Henry Carey Baird & Co., Philadelphia, 1882. Reprint Edition, BeerBooks.com, 2007. Hard Cover, 840 pages, 6.25 x 9.25. For many American brewmasters of the late 1800s, this 840-page monster volume was their absolute bible. First written in German by Julius E. Thausing, professor of the brewing school at Modling near Vienna, the book was translated into English in 1882 and expanded to include material tailored to the American brewing industry. A primary figure behind the English edition was New York brewing chemist Anton Schwarz, whose scientific research had earned him virtual guru status among beermakers. Heavily edited and expanded by Schwarz, this book is as close as the venerable scientist ever came to publishing his lifetime of brewing knowledge in book format. Instead, nearly all of his writings appeared in Der Amerikanische Bierbrauer (The American Brewer), the widely-read brewing journal Schwarz published in New York for more than 25 years. 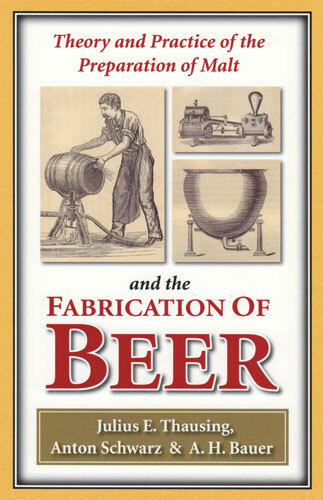 While an assortment of books had become available to brewers by 1882, The Theory and Practice of the Preparation of Malt and the Fabrication of Beer differed from other brewing manuals in two significant ways. 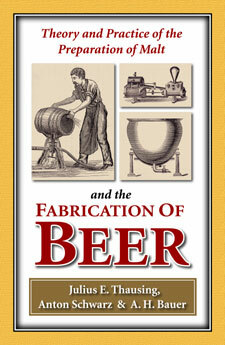 First, this book was among the very few works adapted specifically for American brewers of lager beer. (The great majority of 19th century English-language brewing texts were published in London and were targeted at brewers of British-style beers.) As such, the book serves as a comprehensive and detailed record of the state of brewing science and practice inside the typical American brewery of 1882. Second, while many contemporary brewing texts confined their scope to the treatment of ingredients and the chemical processes of brewing, this book goes beyond those limits and delves deeply into the mechanical operation of the brewery. Virtually every piece of equipment and instrumentation at work inside the "modern" American brewing plant of the late 1800s is meticulously described and illustrated  the book contains more than 140 illustrations! One of the many unique aspects of this book is its indepth discussion of the cooling methods of the lagering cellars. At the time of publication in 1882, beermaking in America was smack in the middle of what many historians have called the industry's greatest technological revolution: the conversion from natural ice cooling to artificial refrigeration. With the industry momentarily straddled between old and new methods, this book necessarily provided readers with a comprehensive discussion of the entire spectrum of cellar cooling technology, from old-fashioned "ice caves," to ice-making machinery, to early systems of artificial refrigeration. It is just one of many examples of this book's tremendous historical value. Be sure to see the Table of Contents below. To make this important text more widely available to brewers, historians and beer enthusiasts, BeerBooks.com has reprinted the book, complete with all the original illustrations -- more than 140 of them! A first-edition copy was digitally scanned, professionally enhanced and reproduced in a hard cover format. Bavaria, Production Of Beer, Revenue, Consumption Of Consumption of Malt, Etc. Definition of Density and Specific Gravity; Density of Numbers of Solid, Fluid and Gaseous Bodies. Methods Mostly Used for Determining the Density of Solid Bodies; Method by the Hydrostatic Balance, Hydrostatic Scale. Method by Areaometer; Nicholson Areometer. Determination of Density of Fluid Bodies; Method by the Hydrostatic Balance. Method by the Picnometer; Method by the Graduated Hydrometer. The Volumeter According to Gay-Lussac; Graduated Areometer. The Densimeter, the Saccharometer of Balling; Scale Areometer. Table for Converting Statements of Balling's (Kaiser) Scale into Long's Pounds. Comparison of Saccharometric Gravities as Shown by the Instruments of Gender, Balling, and Long. Importance of the Microscope in Brewing; General Principles; Effects of a Convex Lens Brought Before the Eye. Refraction of Parallel Rays of Light in a Convex Lens; Image Produced by a Convex Lens When the Object Lies Out of the Focal Distance. Refraction of Rays of Light Emerging from a Point Lying Inside of the Focal Distance of Lens. Image Produced by a Convex Lens When the Object Lies Within the Focal Distance. Optical Effect of the Compound Microscope. The Mechanical Construction of the Microscope. The Use of the Microscope. I. Water; Condition of Water Nature. Water in Reference to its Applicability in the Brewery. Table of Lime Substance in Defferent Waters. Analysis of Some Brewing Waters; Water of Breweries, Pilsen, Bohemia; of Allsopp & Sons, Butron-on-Trent; England; of Brewery of Bass & Co., Burton-on-Trent, England. Water of the Brewery Lein-Schwechat, near Vienna; Brewery WAters of the Principal Breweries of Munich. The Purifying of the Water. Qualitative Examination of the Water. Barley; Importance of Barley as a Brewing Material. Influence of Soil, Climate, and Cultivation Upon the Quality of Brewing Barley. The Anatomical Structure of the Barley Grain. Longitudinal Cut Through a Barley Grain. Piece of a Cross Section Through a Barley Grain. The Chemical Component Parts of the Barley Grain; Organic Combinations Free From Nitrogen, Cellulose, or Cell Substance. Potato-Starch Magnified 300 Times; Rice-Starch Magnified 400 Times. Wheat-Starch Magnified 300 and 800 Times. The Sugars -- Grape-Sugar; Fruit-Sugar; Cane-Sugar; Malt-Sugar; Milk-Sugar. Extractive Matter; The Organic Combinations Containing Nitrogen. The Mineral Salts (Ash Component Parts). The Qualties of Brewing Barley. Cross Section Through a Grain of Wheat. Dr. Bauer's Examination of Varities of American Corn, and Their Values. Table of the Composition of Various Grains; The Potato, Potato-Starch, and Potato-Flour. Potato-Starch Magnified 300 Times; Analysis of the Average Composition of the Potato. III. The Varities of Sugar and Syrup. Average Composition of Thirteen Kinds of Grape-Sugar. Composition of Different Kinds of Commercial Starch-Sugar. Composition of Some Varities of Commercial Glucose. IV. Hops; The Importance of Hops. The Origin of the Hop Culture. The Hop Plant and the Hop Strobile or Cone. Hop Cone; Peduncles of the Hop Umbel Magnified. External View of a Carpel of the Hop Umbel Magnified Five Times; Internal View of a Carpel of the Hop Cone Magnified Five Times; Fruit of the Hop, Seed of the Hop. Side and Surface View of the Hop Gland; Operculum of the Gland Isolated. Examination of Various Hop Samples in Prague; the Varities of Hops, Hop-Cultivating Countries, Hop Statistics. Bohemia; Stiermark; Upper Austria; Galizia; etc. Yearly Production of Hops in Austria, Germany, Bavaria; the Yield 1875-1880 in Bavaria. Baden; Wurttemberg; Alsace-Lorraine; Prussia; the Yearly Product for Germany. Belgium; the Netherlands; Switzerland; France; England; Denmark. Sweden and Norway; Russia; Italy; Table of the Proximate Cultivation and Consumption of Hops in All Countries in the World; United States of America. Quality of Hops Classified from the Continent. English Hops; American Hops; the Chemical Component Parts of the Hop. Analysis of Different Varities of Hops. Qualities of the Hops and the Buying of the Hops. The Smoking of Hops with Sulphur. The Storing and Preservation of Hops. SECTION I. The Preparation of the Malt. Chapter I. The Preparation of the Barley for Malting. The Cleaning and Storing of the Barley. Schwalbe's Barley Cleansing and Sorting Machine. Transportation of the Barley within the Brewery. Riedinger's Grain and Malt Measuring Apparatus. The Storing of the Barley in the Brewery. Chapter II. The Steeping of the Barley. The Object of Steeping, and the Changes in the Barley by Steeping. The Washing of the Barley. Wolf's Valve for Steeping Vats. Proceedings in Steeping the Barley. Chapter III. The Germination of the Barley. The Conditions Required for Germination. The Changes Produced in Barley by Germination. Germinating WWheat; Physiology of Plants; Granules of Starch from Germinating Wheat 800 Times Magnified. Percentage of Dry Extract and Acids in Kiln-Dried Malt. The Malting or Germinating Floor -- the Malt Cellar. Treatment of the Barley upon the Malting Floor (the Preparing of Green Malt). About Mould Fungi; Mucor Mucedo. Copulation-Process of Mucor Mucedo; Zygospore of Mucor Mucedo. Germinating Zygospore of Mucor Mucedo; Mucor Racemosus. Mucor Stolonifer; Urotium Aspergillus Glauces (Euratium Herbariorum). Spores of Penicillium Glaucum; Mycelium of Penicillium Glaucum. Peduncle with Sterigma of Penicillium Glaucum. The Pneumatic Arrangement of Malt Houses. Chapter IV. The Kiln-Drying of the Malt. The Object of Kiln-Drying, and Changes of the Malt by Kiln-Drying. Apparatuses for Kiln-Drying Malt; General Remarks about Kiln-Drying Apparatuses. Malt Kilns Working with Inerruption. Air Kilns with Horizontal Heating Pipes. Air Kilns with Vertical Heating Pipes. Continuously Working Malt Kilns (Mechanical Kilns). Ulrich's Malt Kiln; Jecmen's Blind Kiln. The Treatment of the Malt in the Kiln. Schlemmer's Malt Turning Apparatus for Kilns. Consumption of Fuel for Kiln Drying the Malt. The Qualities of the Kiln-Dried Malt. Changes in the Weight and Volume of Barley by Malting. The Chemical Composition of the Barley Malt in Comparison with that of Barley. Quality and Composition of Ash in Barley. The Determination of the Extract of the Malt and in the Raw Fruit. The Removing of the Germs From and the Cleansing of Kiln-Dried Malt. The Storing of the Kiln-Dried Malt. SECTION II. The Fabrication of Beer. Chapter I. The Production of the Wort, and Preparing it for Fermentation. The Crushing of the Malt. Malt Mill -- Charles Stoll's Patent. The Brewing Process -- the Brewhouse and its Fixtures. Fiederlein's Mashing Machine; the Mash Kettle. Prick's Mash Kettle with Condenser. On the Construction of Furnaces in General, and Furnaces for Mash Kettels in Particular. Steam Pump for Mash and Wort. Mashing According to the Decoction, or Boiling Method; the Vienna Method of Mashing. Decoction Method with Two Mashes, Decoction Method with One Mash. The Old Bohemian Method of Mashing, Flühler's New Decoction Method. Mashing in the Kettle, Mashing According to the Infusion Method. Comparison Between the Decoction and Infusion Methods. The Brewing Upon Satz (Sediment). Method of Brewing by Working Malt Ground to a Fine Flour, and by Using a New Clarifying Apparatus, Welz and Rittner's Patent. Welz and Rittner's Mashing Apparatus. Use of Substitutes for Barley and Malt. Pan Mashing or Kettle Mashing. Chemical Comparison of Malt-Worts, Raw Fruit-Worts and Beer, Decoction Worts, Beer After the Principal Fermentation. The Clarifying (Drawing Off of the Wort). Table of Ash Constituents in the Malt, Grains, and the Wort. Table of Composition of Ash from Malt, Grains, Wort, Yeast, and Beer, Table of the Distribution of Nitrogen from the Products of Barley. Manner of Calculating the Extraction. Grains as Food for Cattle. Chapman's Patent Process for Preserving Grains, Millburn's Machine for Drying Grains. Table of Analyses of Grains Dried by Chapman's Process. The Boiling of the Wort with Hops. Schwarz on the Losses During Clarifying the Malt-Worts and Hopped-Worts. Heating and Boiling of Mashes and Worts by Steam. Gassauer's Brewing Method and Apparatus; On the Use of the Closed Kettle; Steam or Open Fire? Cooling of the Wort, the Cooling House, and the Coolers. Otto's Patent Coolers; the Wort Upon the Cooler. Chemical Composition of Dry Cooler Sediment. The Warm Cooler, the Box Cooler, the Counter-Current Apparatus. Cooling Apparatus of Lawrence & Co.
Chapter II. The Principal Fermentation of the Wort. General Remarks on Fermentation, Introduction, Ferments. Modern Views on Alcoholic Fermentation; Pasteur's Investigation. Mayer's Investigations, Böhm's Investigation, Lechartier and Bellamy. Inferences from the First Series of Experiments. Inferences from the Second and Third Series of Experiments. Bud-chains of Saccharomyces Cerevisiae (Bottom Yeast) - Magnification. Formation of Ascospores from Saccharomyces Cerevisiae - Magification. Bud-chains of Saccharomyces Cerevisiae (Surface Yeast), Oblong and Rounded Cells - Magification. Fermentation Fungi in Self-fermenting Fluids. Mould Fungi and Alcoholic Fermentation. Sound Beer Yeast (Bottom Fermentation); Beer Yeast with Impurities of Albuminates and Oxalate of Lime. The Fungi of Acetic Fermentation, Fungi in Beer-wort and in Beer in the First Stage of Fermentation (Self-fermentation). Turned Beer (Sour Beer), Wort Beer with Ferments of Lactic Acids. The Chemical Composition of the Alcoholic Fermentation Fungus. Composition of the Ash of Yeast. The Vegetative Requirements of the Alcoholic Fermentation Fungi; Heat. A Suitable Solution of Nourishing Substances. The Products of Alcoholic Fermentation. Other Fermenting Processes; Vinegar Fermentation (Acetic Fermentation). Bacteria of Acetic Acid, Magnified. The Principal Fermentation of the Beer-wort in Particular; Introduction. The Fermenting Room According to Brainard's System. Pfund's, Stoll's, and Wold's System. Fermenting Vessels of Glass; Fermenting Tuns of Wood. Werner's Lac Varnish for Fermenting Tuns. The Best Form of a Tun. The Number of Fermenting Tuns Required. The Bottom or Low Fermentation; The Beer Yeast. Manner of Judging of the Yeast; The Microscope in the Examination of the Yeast. Storing of Yeast; Pressing and Drying Yeast. Quantity of Yeast Produced from the Fermentation of a Certain Quantity of Wort. The Setting (Stellen) of the Wort with Yeast (Zeuggeben). The Wort During the Principal Fermentation. Cold Fermentation Customary in Vienna. Vaass and Littman's System of Fermenting Room. Abnormal Phenomena During the Principal Fermentation. Shoving (Nachschieben); Standing Still (Das Rasten). Bubble Fermentation (Blasengahrung); The Racking Off of the Beer. Drawing the Ripe Beer from the Fermenting Tun. The Cell Fermentation of Beer Worts. Chapter III. The Beer After the Principal Fermentation. Dividing the Cellar; Store-room for Ice. Advantages of the Brainard Cellar. Storing-cellars Above Ground (American Cellars). Ice; Natural Ice, and How It May Be Procured. The Different Processes by Which the Temperature can be Lowered and Water Artificially Frozen; by a Solution of Salts; by Evaporating Fluids; and by Expansion of Gases. Division of Ice Machines into Two Groups; Evaporation Ice Machines - The Ether Ice Machine. Carbonic Acid Ice Machine, the Amonia Ice Machine, Carré's Ice Machine, improved by Vass and Littmann. Vaas and Littmann's Continuously Working Ice Machine. The Advantages of These Machines. The Running Expenses of Vaass and Littmann's Ice Machines. Linde's Ice Machine; the Evaporator. The Condensor; the Condensing Pump. The Largest Ice Machine at Present in Existence. The Number, Capacity and Cost of these Machines; Pictet's Ice Machine. Barrels of Water Cooled Off Per Hour. Air-expansion Ice Machine; Windhausen's Refrigerating or Cold Air Machine. Running Expenses of a Windhausen's Cold Air Machine. The De La Vergne and Mixer Ice Machine. Neubecker's Pitching Machine for Large Barrels; Anheuser's Pitching Machines; the Sulphering of Barrels. Zoller's Barrel Inside Cleansing Machine. The Treatment of the Beer in the Store Cellar. Shavings; the Use of Shavings. The Bunging Apparatuses of Modern Times. Pfaudler's Excelsior Pressure Regulator; Dr. Bersch's Automatic Fermenting Bung. Pohl's Bung Improved by Zoller; Zwietusch's Bunging Apparatus. Abnormal Phenomena in the Beer During After-Fermentation; Turbidity of the Beer; Sick Beer. The Use of Krausen and Shavings. Cause of Beer Becoming Flat. The Souring of the Beer. The Racking Off and Delivery of the Beer; Tapping Barrels; Zoller's Patent Tapping Apparatus. The Sale of the Beer. The Beer in the Cellar of the Saloonkeeper. Beerm the Component Parts and Qualities of; Nutritive Qualities of Beer. The Beer Test by the Saccharometer, According to Balling. Table I. of the Alcohol Factors and Questions of Attenuation for the Fermentation of Beer Worts, According to Balling. The Aerometric Analysis of the Beer, According to Metz. Table II. showing the Relation Between the Specific Gravities and Percentages of Extract, According to Balling. Table III. showing the Relation Between the Specific Gravity and Percents of Extract, According to Balling. Table IV. for Determining the Amount of Extract Contained in Clear Decoction Worts and in Infusion Worts and Solutions of Beer Extract Freed from Alcohol, According to Dr. W. Schultze. Table V. showing the Relation Between the Specific Gravity and the Percentage of Alcohol, According to Fownes. Table VI. for Determining the Percents of the Volume and Weight of Alcohol in the Examination of Beer from the Specific Gravity Found at 15.6° C. (60° F.) by Dr. A.H. Bauer. The Determination of the Extract in the Beer According to the Direct Method. The Determination of the Alcohol in the Beer by Distillation. The Determination of the Alcohol in the Beer by Evaporation. Determination of the Original Concentration and Degree of Attenuation from the Percentage of Extract and Alcohol in the Beer. The Determination of Carbonic Acid in the Beer. The Determination of Sugar and Dextrine in the Beer. Examination of the Beer for Acidity. The Determination of Ash in Beer. The Determination of the Viscosity and Color of the Beer. Tables showing the Relative Values of English and French Measures. Comparison of Centigrade and Fahrenheit Scales, and Approximate Steam Pressure in Pounds and Atmospheres per Square Inch due to the Temperature.